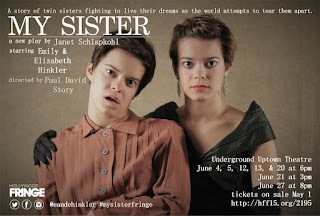 My Sister by Janet Schlapkohl marks my first review of the 2015 Hollywood Fringe Festival. Honestly, it sets the bar pretty damn high. 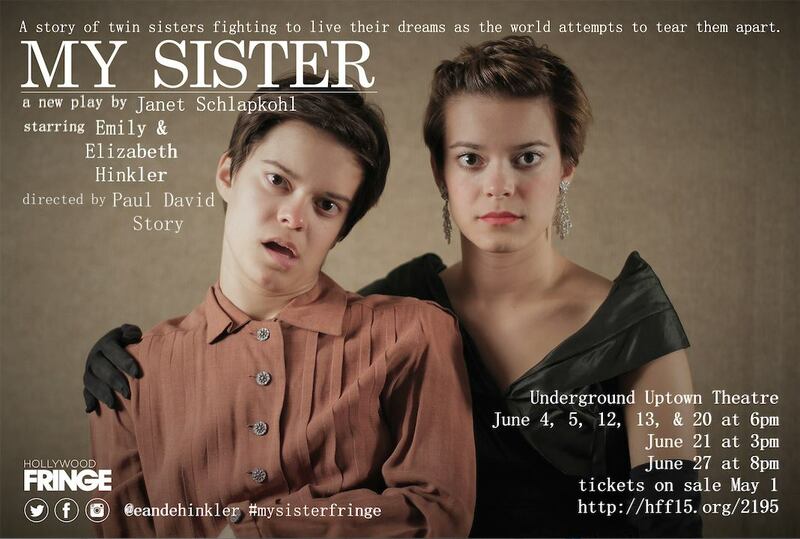 "A story of twin sisters fighting to live their dreams as the world attempts to tear them apart." reads the tagline, and that certainly proves accurate. If insufficient. We're a little too used to that verb--tear apart--to feel its full power. Imagine your hand torn apart, until flesh and bone ripped asunder. Or your tongue pulled out of your skull. Nothing that bloody happens on stage. Emotionally, however, that is precisely what happens to these two souls. 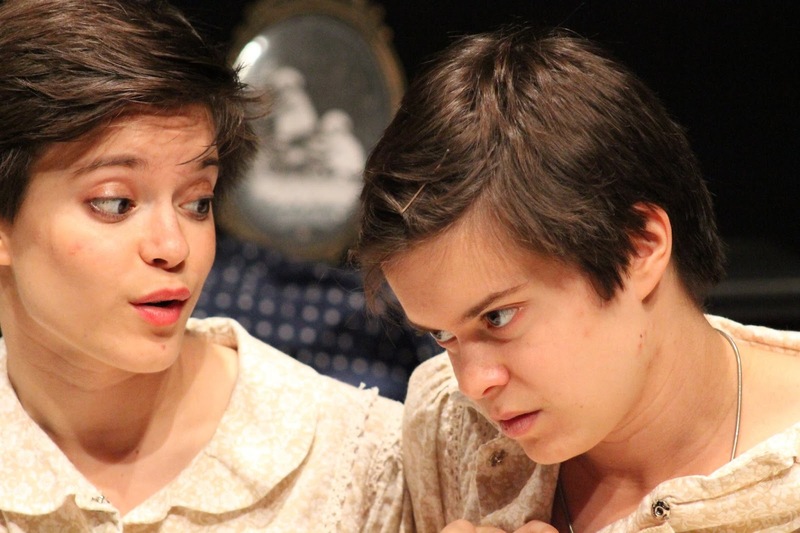 Emily and Elizabeth Hinkler (real life twin sisters) comprise the entire cast--at least the ones we see. 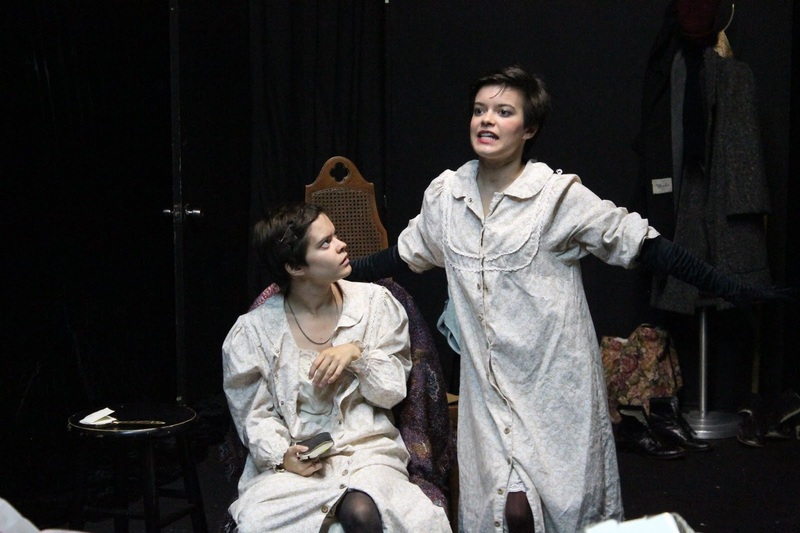 From the moment the play begins, others hover around the tiny one room flat they share in 1930s Berlin. Magda is a Cabaret performer at night, a cleaning woman in a public hospital during the day. Matilde, who has cerebral palsy (so I was told later--I wasn't qualified to say what she had but felt utterly certain she knew), writes her sister's material and by listening to her radio has managed to perceive very much what is going on in the outside world. Adolf Hitler is now Chancellor. National Socialists are cracking down on outsiders, censoring art and humor and songs. Magda just wants to survive, to get along. Matilde, she sees with increasing terror what it means that the government is now taking away the "incurables" for "special treatment" from the hospital where her sister works. Something like this could end up so maudlin and sentimental. Likewise it could show nothing but darkness ascendent. That is focuses instead on the truth of the moment, of two sisters seeing the world in different ways despite very nearly sharing the same heart. The Third Reich and the Holocaust seem like such gigantic tragedies, in no small part because they are! Yet for that reason maybe we lose focus. We have a hard time wrapping our skulls around what it meant as civil liberties were taken away one by one, what it must have felt like as anyone different tried to seem 'normal' out of slowly suffocating terror, to see the consequences of words airily repeated put into practice. My Sister doesn't deal with the war, or why people enjoyed listening to Hitler speak, or debate over treaties. It shows LIFE, in two gallant but flawed souls simply trying not to drown in a deluge. It shows foolishness and wisdom, joy and recklessness, wit and lots of different nuances in courage. I felt humbled and my heart took a blow that needed about seventy five minutes to land--leaving me floored.